Whisk the mustard into the acid. 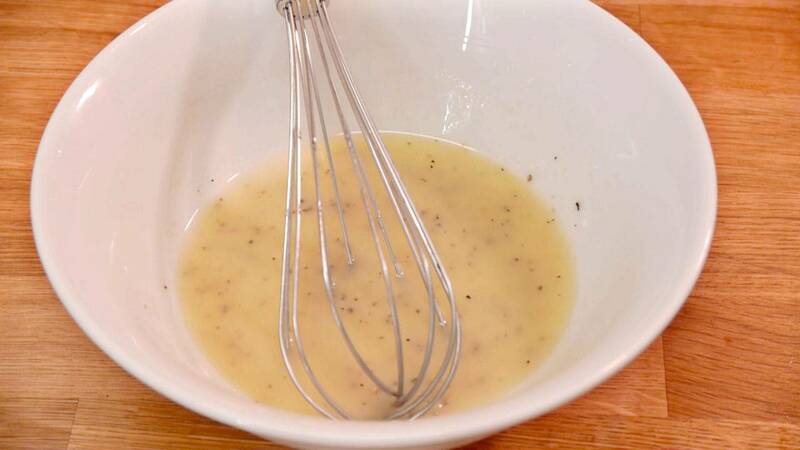 Whisk in the oil until it is creamy and smooth. The recipe is generally 1 part acid to 3-4 parts oil, and a little mustard to make it creamy. I guess you could use egg yolk if you don't like mustard. That would make it into a runny mayonnaise. 10 g (1/3 oz) herbs (1 bundle) parsley, dill, coriander, garlic, estragon, chervil, oregano, thyme, basil, or whatever you have of fresh or frozen herbs. You can basically mix the ones you want to what you think fits the dish you are making. You can use dried herbs, but then the dressing must rest a little longer to spread the flavors. Finely chopped onions, spring onions, shallot, olives or chopped tomatoes.